My wife and I are bone collectors. We stop for roadkill and reverently take what is offered up. 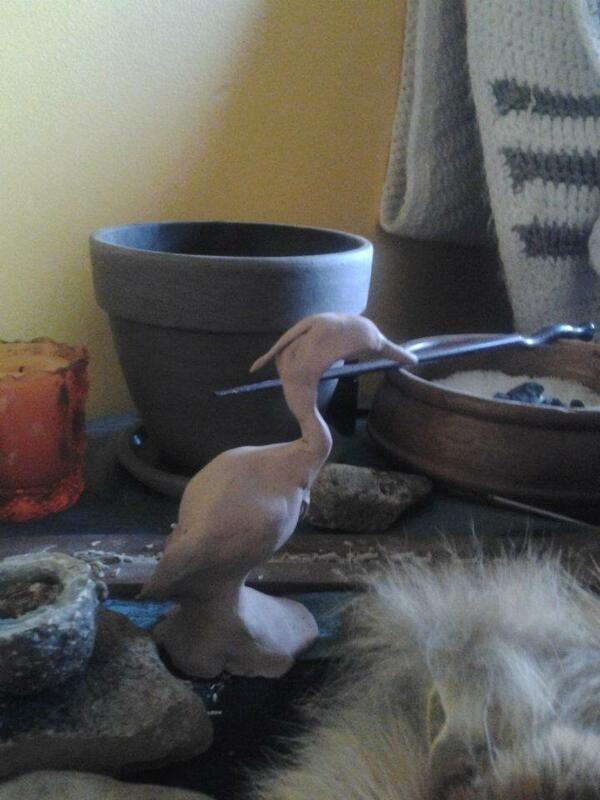 It may sound gruesome, but it is a way of honouring the lives and spirits of these animals. Perhaps a year ago we came upon a porcupine at the side of the road. Its quills were scattered everywhere, far further than we could imagine. 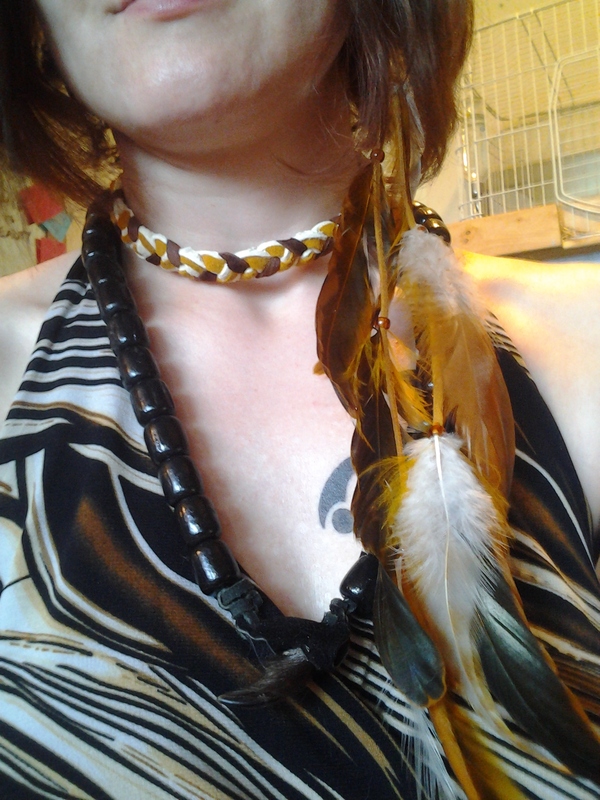 I blessed the animal with herbs and seeds and salt from a tiny pouch that I keep with me, sacred. Then we collected some quills and my wife took four claws. 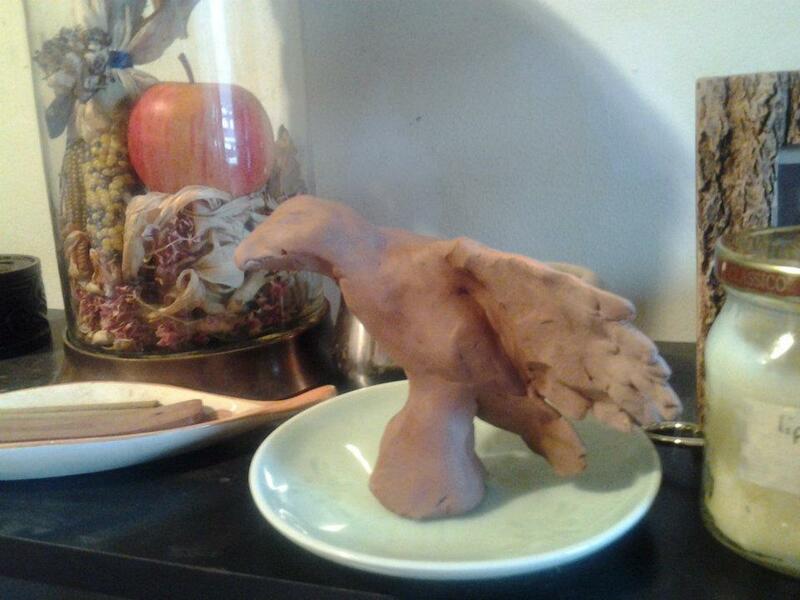 The claws she preserved in Borax, and last night I felt called to make something from them. I wanted a powerful, large necklace — black, to remind me of the ‘darker’ realities of death and destruction that are valid parts of life. I don’t know if I can truly embrace death and destruction, and I do not seek evil. But I do seek the neutrality of the universe. My next experiment is a muscle/sciatica salve for my wife and others in my family. 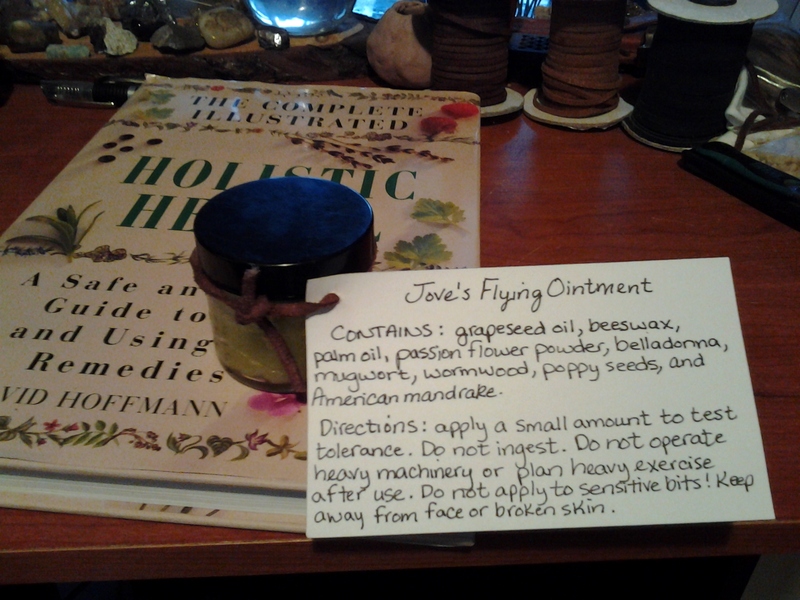 I have refined my ointment-making skills, now that I have proper ingredients like grapeseed oil and beeswax. My wife came home with belladonna a week ago and I’ve been playing with it (carefully) ever since! I’ve also found that passion flower does nice things for me, which was unexpected, and the result is almost a spiritual ADHD remedy. 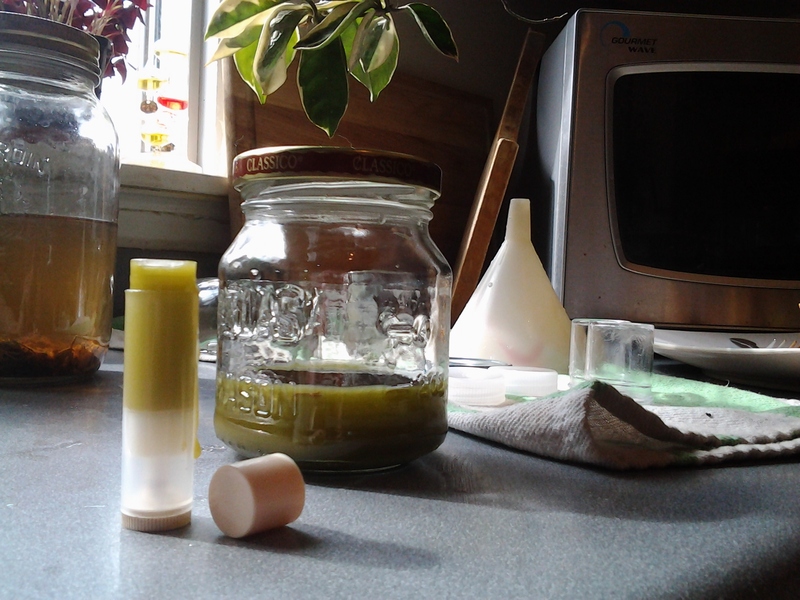 I’ve been making mystical lip balm as well, with milder but still potent herbs. 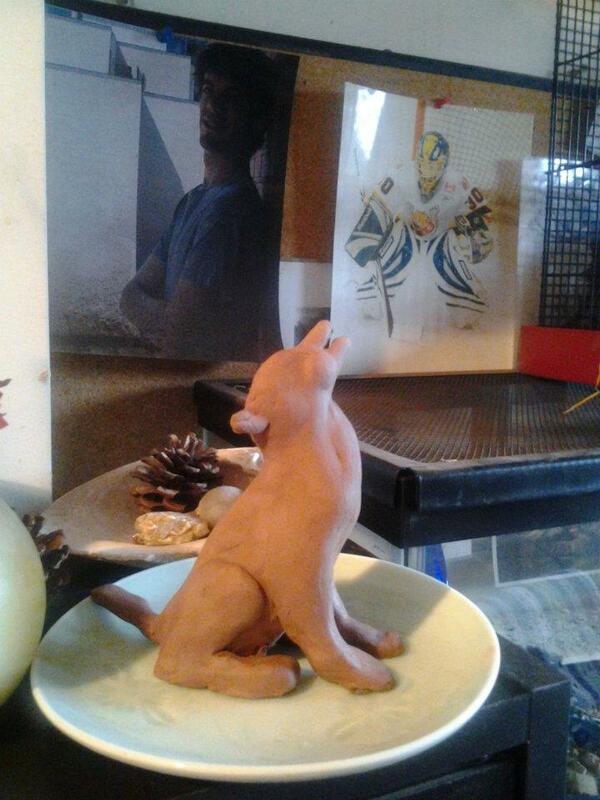 One way to honour your totem animals, or spirit guides, is to make representations of them as reminders. This can be as simple as painting a sketch on flat stones. 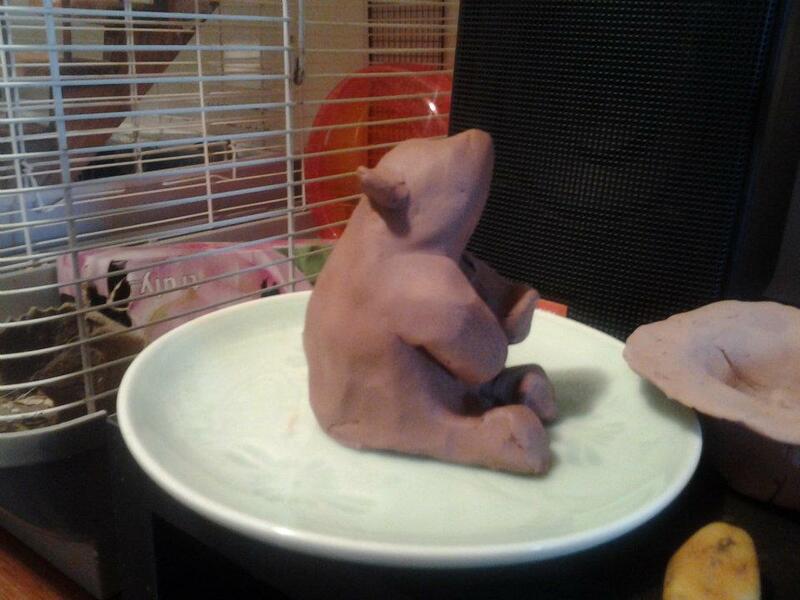 This weekend I made some clay animals for my altar. 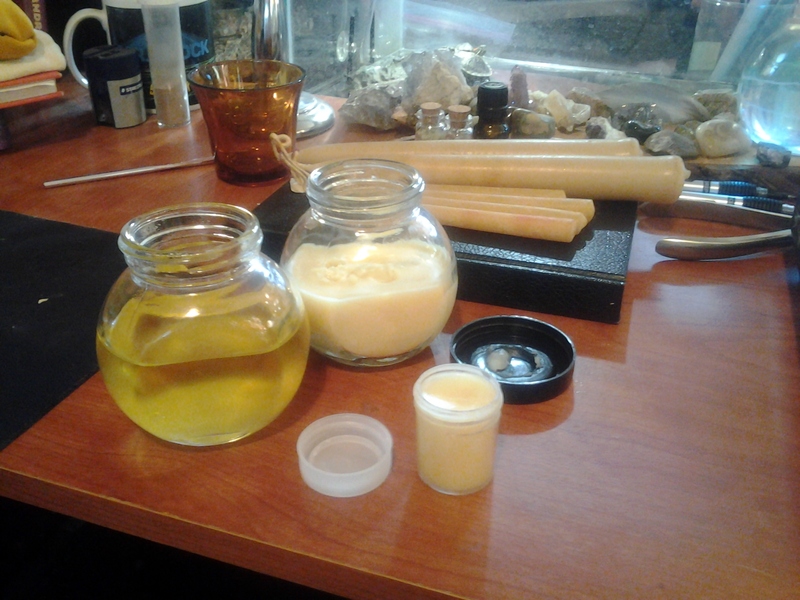 Today I made some lip balm and an amber-scented massage lotion with beeswax and grapeseed oil. 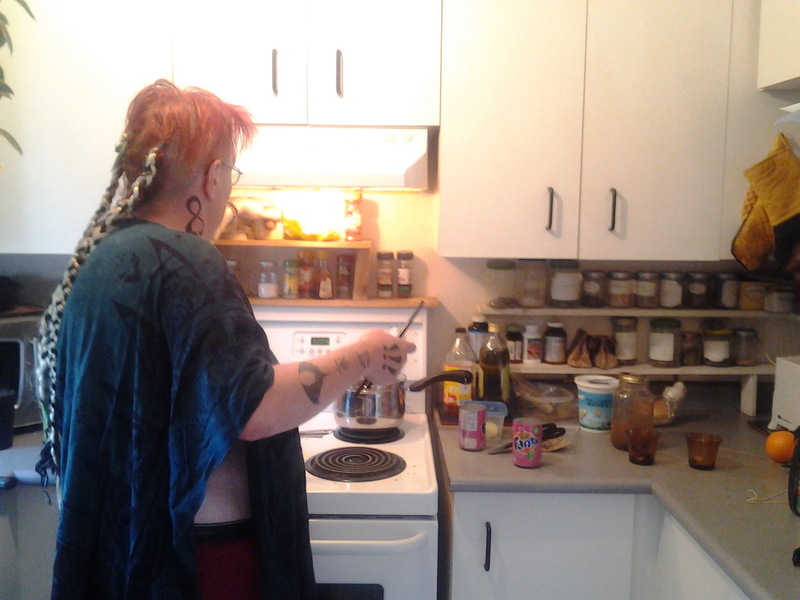 It’s so easy and so fun, and makes great home-made gifts for kitchen witches! 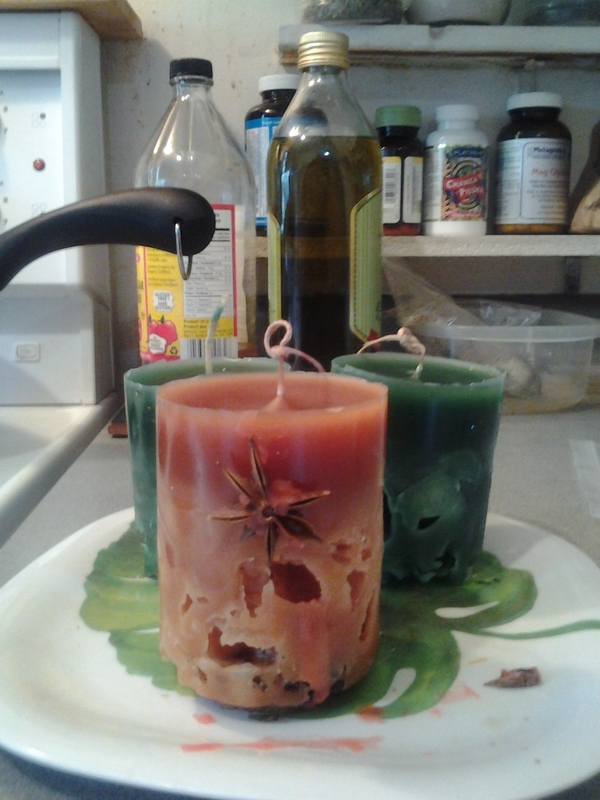 My wife and I are spending the afternoon making candles. Some done with ice, to achieve a holey effect; some done with herbs, stones, and magical intent. 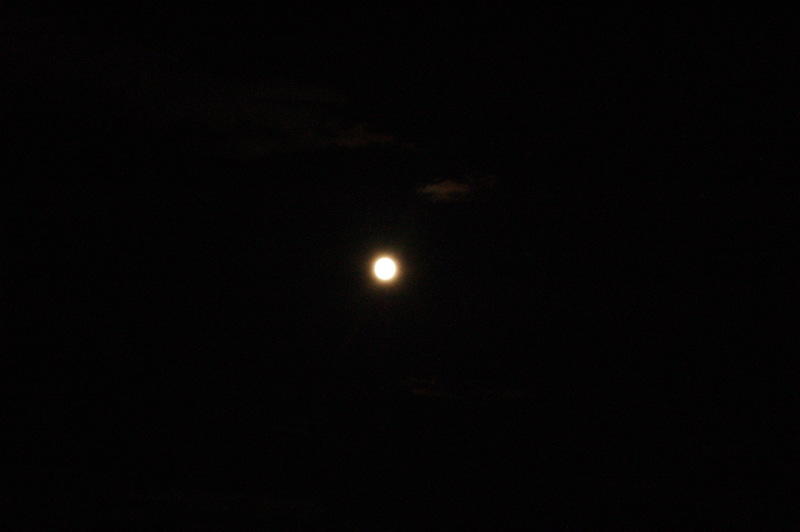 Last night my wife and her dear friend and I went on a country drive to enjoy the extra-bright full moon. 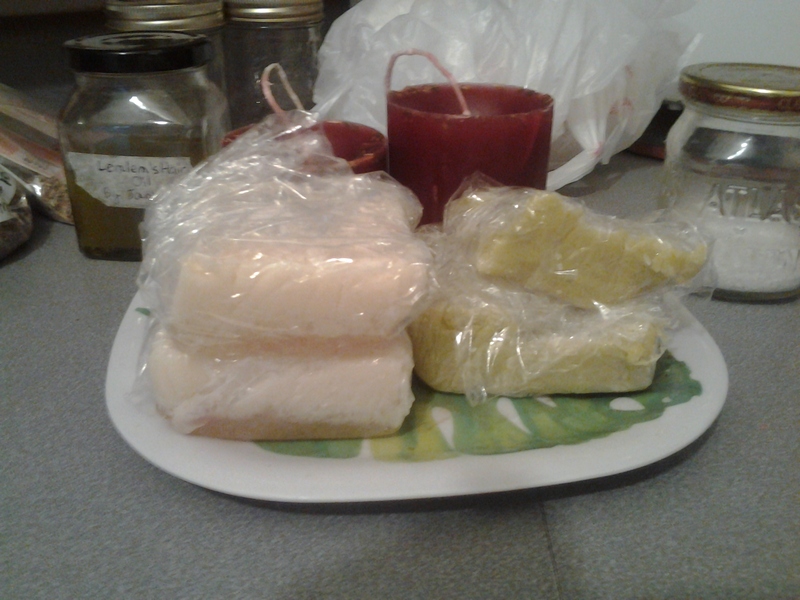 I had wanted to do something for the full moon but thought I needed something more than candles and incense and prayer. So I slathered myself up in my homemade flying ointment and off we went. I was very surprised when I began to feel physical effects from the ointment, since I used none of the more poisonous ingredients. It felt like the veil between worlds had thinned; everything felt alive. I felt wonderful and slightly distracted by pretty glowing streetlights, though my mind was still sharp. We drove for about an hour and a half, sighting two raccoons and — surprisingly — a possum. I prayed and asked for communion with the spirits. Earlier that day I had pulled the Communion card from my Earth Magic deck, which I have pulled several times recently. I’m not a very visual person; I wish I could say I saw spirits last night. But I felt them. I knew they were there, speaking to me. And there is nothing disappointing in that. I need to open my mind a little more and stop harping on the visual side of things, since I access the spiritual realms in a different way. I am learning, slowly.